Say, is that light at the end of the tunnel? LEFT: disassembly pic (I forgot to take a clean version of this image) of the case with solenoid pack removed. RIGHT: solenoid pack cleaned up and installed with a fresh gasket. One of the first parts removed during teardown was the solenoid pack. On the side, it bears a warning that opening the pack could “alter calibration”. And since my instructions included no procedures for cleaning or rebuilding, I simply set it aside and left it alone. Fortunately, it’s a fairly easy component to access, so I decided to take a chance that it was probably still good. All I did was prep the gasket surface and clean up the exterior before re-installation. If there are still problems after the trans is back in the vehicle, this solenoid pack can be changed out in minutes. These two threaded holes are for the input & output speed sensors. One is coarse thread, the other fine. I guess I must have been too eager to finish, and thus forgot to take a picture of the crankshaft position sensor. So here’s a picture that I found online. It goes into a hole in the bellhousing, on top near the differential, and reads from the flexplate. After purging the cooler lines of old fluid, it was finally time to move the transmission underneath the vehicle and prepare for installation. The torque converter slides onto the input shaft, and seats against the pump. 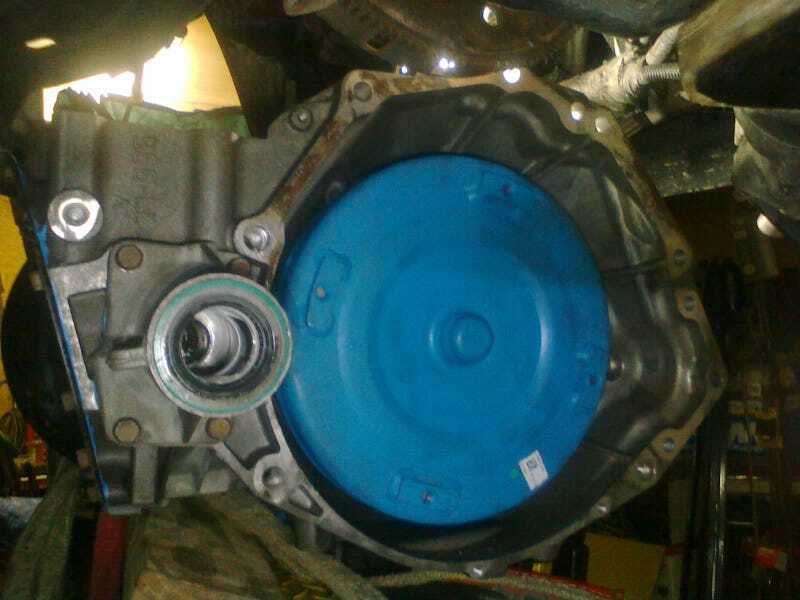 With no way of bench-testing the torque converter, I decided to get a fresh one to put in. Make sure it’s seated all the way! After wrestling the whole thing back into place, it could finally be bolted back up. With the dipstick tube back in, the unit could be filled with fresh ATF+4. I had used about a quart for soaking frictions and wetting parts for assembly. Another ten quarts were needed to top off the transmission and its cooling circuit.